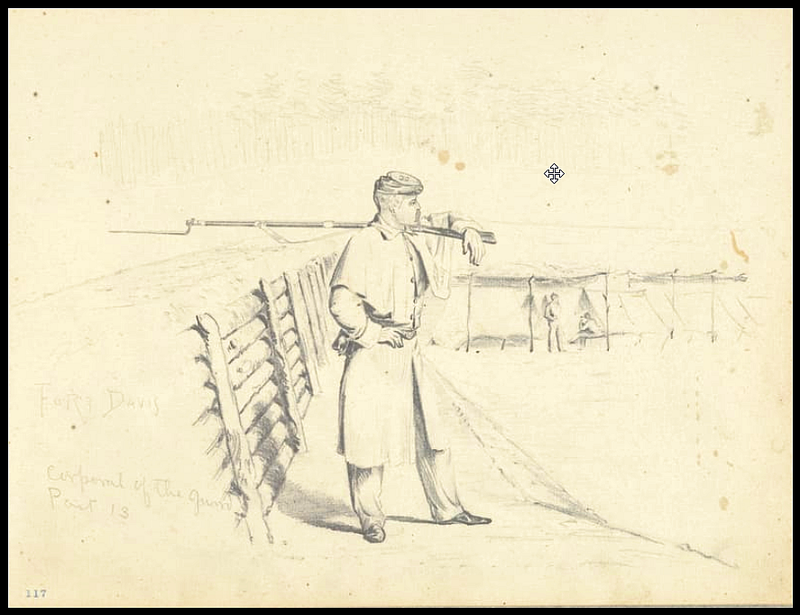 This is the only identified historic photograph of Fort Davis, initially called "Fort Warren," but as you can see here that it was the subject for numerous pen-and-ink artists who captured all of its angles. The fort was the brainchild of G.K. Warren, who personally shepherded it through every phase of construction. This square redoubt with a massive diagonal traverse was large enough to hold a brigade of 2,000 infantry, or something on the order of a Roman legion. 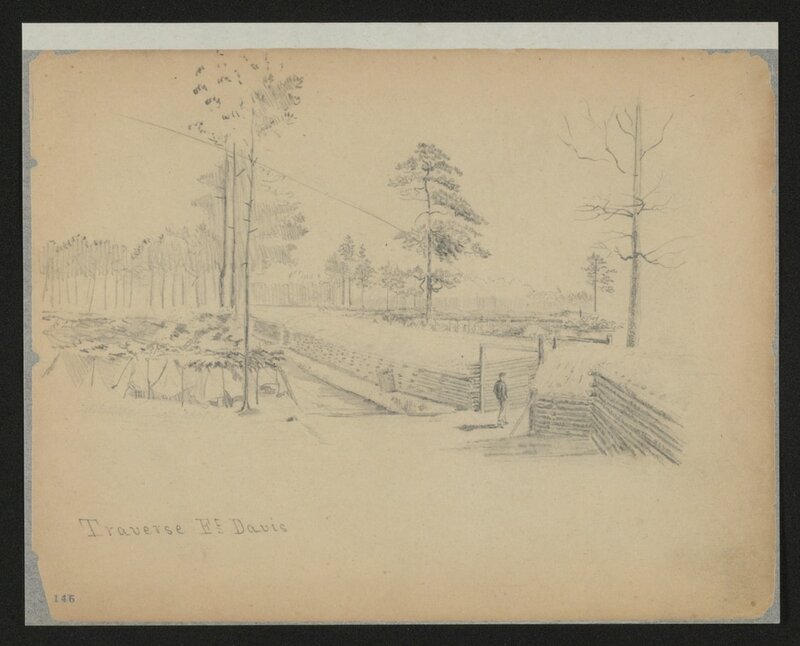 Chief Engineer of the Army of the Potomac, James Duane, envisioned a series of 4-6 forts of about this size holding the entire line from Jerusalem Plank Road back to the Appomattox River. After the "Grand Medicine Pow-wow, a new concept was adopted -- smaller, enclosed forts, redoubts, and batteries with garrisons of 100 or 200 men, connected by infantry trenches. Later on, it was decided that the infantry trenches could pretty much be manned by a picket line if backed by a strong reserve. The engineers decided that the ground could be held mostly by artillery, supported properly by a few hundred infantrymen. This was a giant step in the continuing development of trench warfare at Petersburg. The driving force on the Federal side -- hold more ground with fewer soldiers. 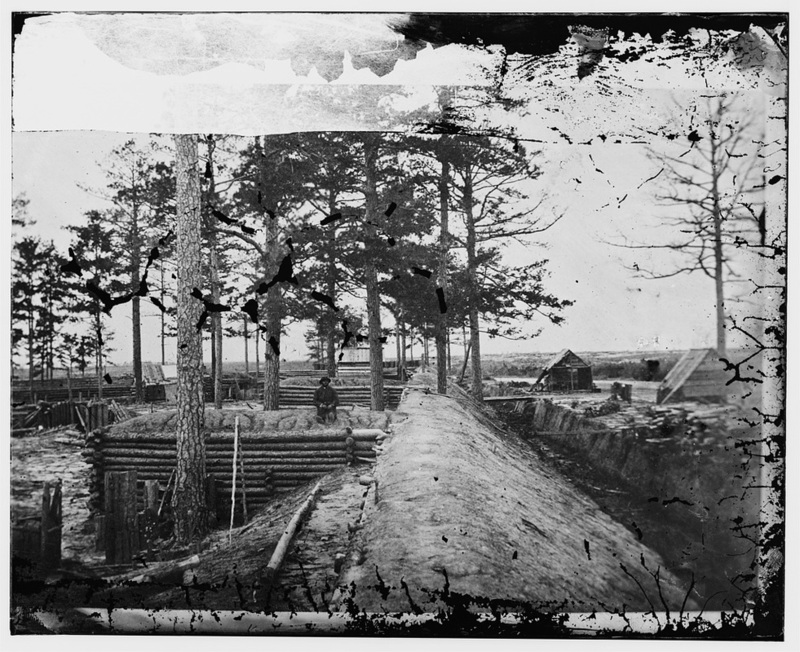 Confederate engineers had the same problem but continued to build the same redan-redoubt lines that dated back to earlier in the war. Fort Davis is owned by the City of Petersburg. One might say it is "protected." G.K. Warren's statue on Little Round Top might as easily be recreated in Fort Davis. It may be his largest visible structural contribution to the American Civil War. LC 03344. 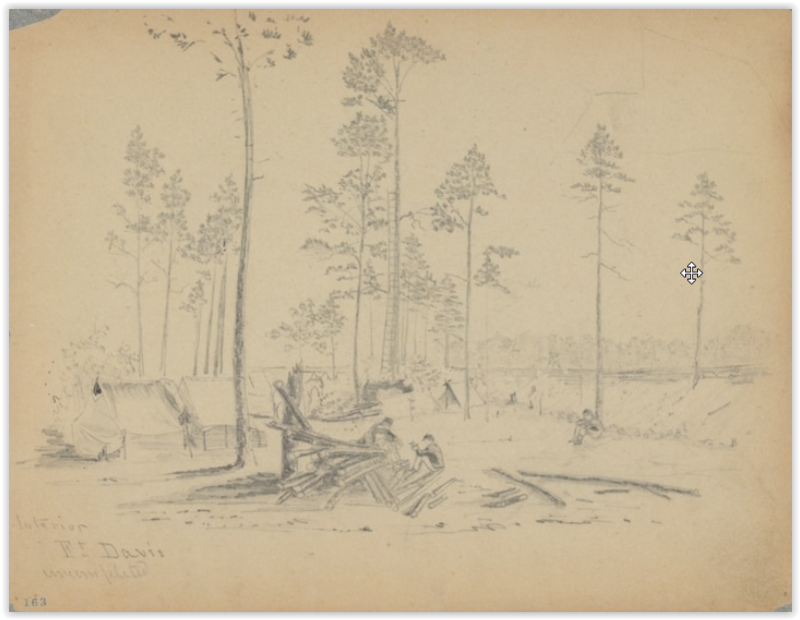 This unattributed image (LC-BH84- 60), captioned "Fortification - Petersburg?," is of Fort Davis, taken from the southeast angle of the fort looking north. Jerusalem Plank Road passes by the two structures at the right. The bridge spans the ditch at the sally port. Identity confirmed by Chris Calkins. General Warren is now in his element: so far as I can learn, he is his own officer of the trenches, and commander of the working parties. There is nothing that he likes so much as overseeing work, and is consequently in a most agreeable humor. I spent some hours with him yesterday in the large redoubt, which one might easily believe he had undertaken to build by contract, and certainly has pushed forward with most wonderful rapidity. It is an immense work, five hundred feet front I believe, and perfectly square (p 436). Colonel Charles S. Wainwright, A Diary of Battle, edited by Allan Nevins, DaCapo Press, New York,1998. "Fatigue party building Fort Davis." Jerusalem Plank Road is labeled in the foreground. Drawing by Charles Wellington Reed. Charles Wellington Reed Papers, Library of Congress Mss. Division. 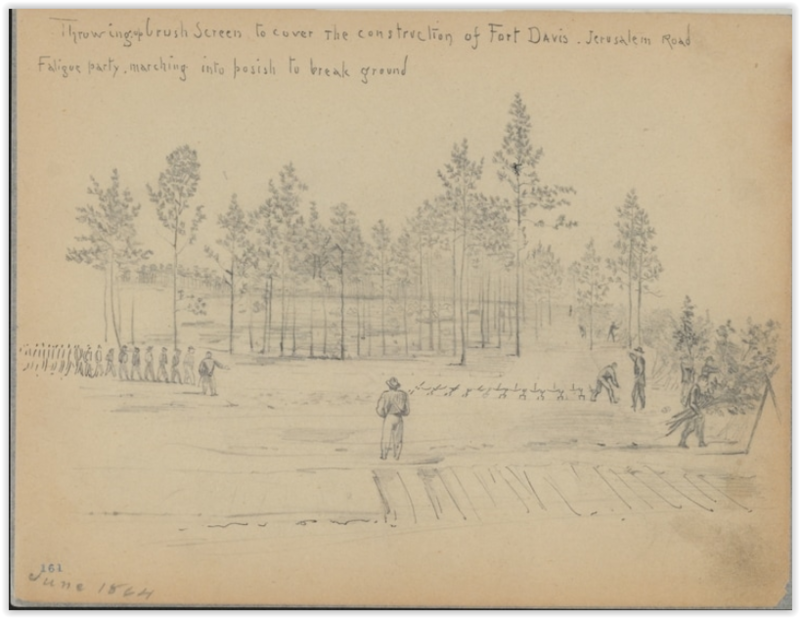 Throwing brush screen to cover the construction of Fort Davis. Jerusalem Road. Fatigue party, marching into posish to break ground. Drawing by Charles Wellington Reed. Charles Wellington Reed Papers, Library of Congress Mss. Division. 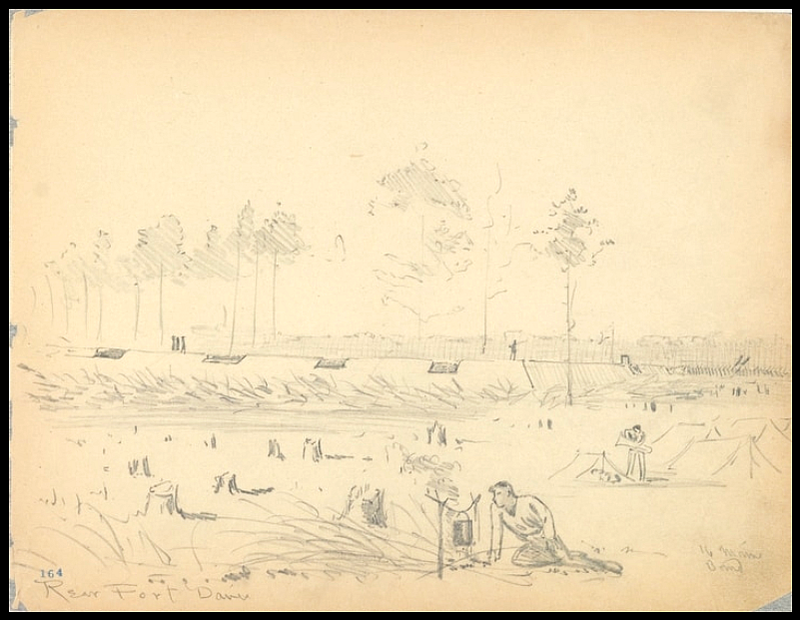 "Fort Warren Va, on Jerusalem Road near Petersburg," drawing of Fort Warren (renamed Fort Davis) by George Dean, 39th Massachusetts Infantry, Petersburg National Battlefield. File contributed by Emmanuel Dabney. Traverse Ft. Davis. Drawing by Charles Wellington Reed. Charles Wellington Reed Papers, Library of Congress Mss. Division. Drawing by Charles Wellington Reed. Charles Wellington Reed Papers, Library of Congress Mss. Division. Interior, Ft. Davis. Uncompleted. Drawing by Charles Wellington Reed. Charles Wellington Reed Papers, Library of Congress Mss. Division. Rear. Fort Davis. Drawing by Charles Wellington Reed. Charles Wellington Reed Papers, Library of Congress Mss. Division. Fort Davis. Corporal of the Guards. Drawing by Charles Wellington Reed. 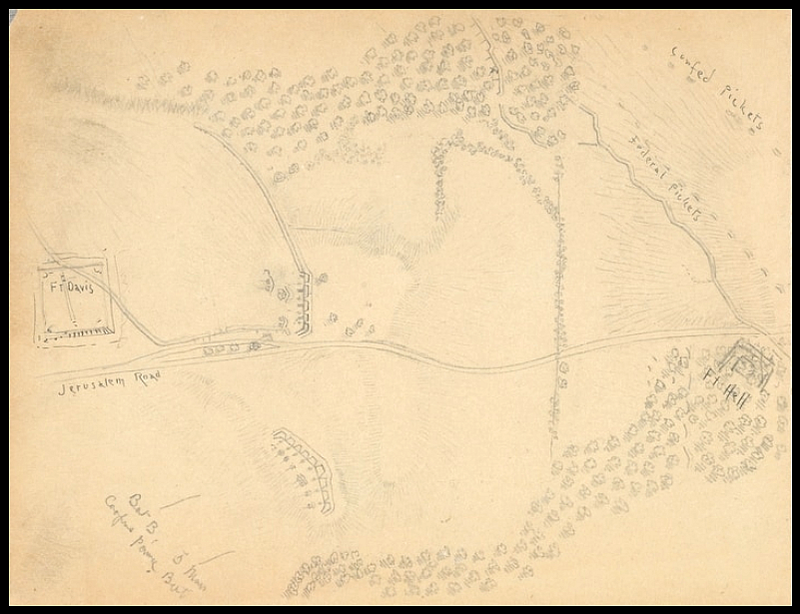 Charles Wellington Reed Papers, Library of Congress Mss. Division.